The arrow in the markers indicates the direction of the path. At intervals along the route, there are numbered markers which highlight interesting features in the booklet. The numbers on the markers correspond with the numbers in the brochure as you follow the directional pointers. 1 Please start your walk at marker no 1 near the Alexander gate and follow the trail markers and the numerical sequence. 2 On the way to the second pointer and marker no 2 notice the plants between the grasses. On the right hand is a patch of Hypoxis visible only in summer. This bright yellow flower abounds in the veld and many gardens have been relandscaped without a thought for the myriads of veld flowers, which could have been used successfully in the garden. The Kuni-bush (Rhus pallens) No 390.3, an evergreen shrub with bright green wavy leaves. Wild Pear (Dombeya rotundifolia) No 471. This tree is characterised by large, hairy almost circular leaves, and is usually conspicuous with its snowy white blossoms in early spring. Shangaan women drink a decoction of the bark to hasten the onset of labour. For those who have a stressful lifestyle, the Zulus advise an infusion of the bark to treat intestinal ulcers. Red leaved Rock Fig tree (Ficus ingens) No 53. which is very popular with birds in Summer when the small round figs are ripe. The leaves are only red in Spring and later change to green. The next tree of note on the left is a Mountain Karee (Rhus leptodictya) No 387. This small tree occurs in a variety of habitats, one being rocky places. The plant does well in cultivation, and makes a striking garden subject. The tree is hardy in forests and is fairly drought resistant. The yellow-brown to orange fruit can be made into an intoxicating liquor. 3 If you turn left immediately after passing this tree, at marker no 3, you will find the first small granite quarry very close by. At the next pointer you will find a Wild Pear on the right. On the left is a Buddleja saligna No 636 (false olive). It has willow-like leaves that are darkish green on the upper surface. On the under surface they are much paler, being covered with pale hairs. The flowers are white or cream, and sometimes have a reddish throat. They are honey-scented and are borne in heads about 12cm in diameter. Next to it on the left is the Rhus pyroides No 392 commonly known as the taaibos or wild currant. The tree is often the first plant around which a new clump of bush may form. The main stems are brown, often bearing long thornlike branches. 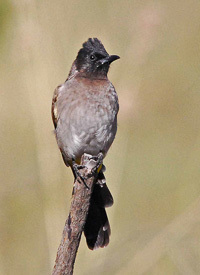 Most fruit eating birds feed on the red-brown fruit, which appears between November to May. A prick or scratch from the thorns will sting and burn for some time, hence the name ‘pyroides’. The wood is good for making implement handles and fencing posts. 4 The trail veers to the left in order to skirt the grassland area where the Blesbok may be seen. Turn sharp left to marker no 4 and take a short walk to the left to view the large quarry where granite was extracted. It is so deep that it usually has water at the bottom. It is only filled by rainwater and the level of the water table. Look for Dassies, Klipspringer and Slender Mongoose. A clump of Kraal spike thorn (Gymnosporia polyacantha) (no number) will be seen on your left before you rejoin the main trail. 5 On returning to the main trail, if you are interested in trees, you may cross the main trail and walk ± 35 paces to marker no 5 where you will see a long stemmed tree on the right side of the path growing out of a pile of granite rocks. This is the Wild Medlar (Vangueriainfausta) No 702, which is seldom found in this area. The specific name of this tree means ‘unlucky’ and many Africans, believing that it possesses evil powers, will not use the wood, even as fuel. The roots are regarded as a remedy for a number of complaints, including malaria and pneumonia. It has long been known that the pulp when mixed with a little sugar and water, makes a good substitute for applesauce, and has been used in puddings. Look carefully at the leaves – you may notice small gall-like growths. These are caused by a species of fungus, which often attacks these trees. The leaves are tough, leathery, hairy and parchmentlike. On once again returning to the main trail, look out for the Ostrich, Spotted Dikkop, Guinea Fowl, Hadeda and Red Necked Francolin. Tortoises could also be seen in the reserve. 6 The next pointer is at a large Celtis Africana No 139 (White Stinkwood). Turn left at marker no 6 to see the large quarry from another perspective. The debris left by the quarrying provides an environment for animals, particularly Dassies, hastens the weathering process and creates suitable habitats for plant colonization. Heteromorpha trifoliata No 568 (Parsley Tree) is often found at or near a quarry site, and can be seen growing in between the granite blocks remaining from the quarrying days. This tree can be seen on the top of the quarry on your left and right as you look into the quarry. The bark of this tree is smooth, somewhat waxy in appearance and characteristically peels in almost papery flakes. This is a fast-growing tree and in traditional medicine, an infusion of the leaves is used as an enema to treat abdominal disorders or as a remedy for mental and nervous conditions. When the smoke from the wood is inhaled, it is said to relieve headaches. The fruit contains a volatile aromatic oil. Several Buddleja saligna partially obscure the old headgear. The durability of granite also made the rock attractive to quarrymen seeking stone for monumental masonry and natural stone cladding. The stone was quarried with the use of explosives, which were inserted into drilled holes. These rows of holes are still visible on many faces and blocks. Most of the grey granite was exported to Europe for use as gravestones. The quarry was active up until the 1950’s. The scars of the quarry enable you to see rock which has remained unaltered for over three thousand million years, roughly two-thirds the age of this planet. The granite is of medium size grain but pegmatitic intrusions (very coarse grained) are seen. Granite consists of quartz, feldspar and mica. The chemical composition of these minerals is silicon, aluminium, calcium and oxygen. Other trees in this area include the Bush Cherry (Maerua cafra) No 133. This is a shrub or small tree, which would make an ideal ornamental subject in a garden. The fruit is rounded and plum-like. The wood is brittle and has an unpleasant smell when cut. Just past the Maerua cafra, there is a scrambling shrub. This is the Soap bush (Helinis integrifolius), a strong liane. The leaf sap of this relieves the itch caused by sandworms. 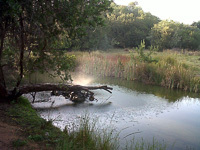 7 Rejoin the trail and turn left ± 30m further in front of the Wild pear to marker no 7. There is a path, that leads into the granite tor area. You will discover a flat granite-chip strewn area and thereafter a large pile of extracted granite blocks, which were never removed by the miners. Continue past the first granite pile on your right, under a canopy of trees, and you will see a Maerua cafra with attractive bright green leaves growing on the cliff side on your left. 8 After a short walk back to the main trail a further turn to the left is indicated by marker no 8 which will take you on a rocky path past many Rock Alders (Canthium mundianum) No 710. Veer to the left over a large flat rock and Rock Figs. You will pass a big Dassie midden at the foot of the boulders on your left which can easily be climbed to provide a panoramic view of the area. You will also be able to see the very large Redleaved Rock Fig situated at the end of this little walk. Large specimens like this one are rare. 9 On returning to the trail, look East to marker no 9 and you will find a Common spikethorn (Gymnosporia buxifolia) No 399 ± 23m in front of you. This tree usually reaches 4-5m in height. The bark is grey and deeply fissured in older trees. The leaves are greyish-green, often clustered and can occur on thorns. The flowers are small, white and have an unpleasant smell, which attracts insect-eating birds. The tree is considered a medical and magical tree and certain tribes use parts of it as love charms. This tree appears as a bushy shrub in the reserve due to leaf cropping by the rock rabbits. When you have rejoined the trail you will see three trees on your right with fern-like leaves. These are Acacia caffra No 162, which is the least thorny of the Acacia species. Being drought resistant, rapid growing, frost resistant and very attractive, this tree would do well in a private garden. The wood, though not used commercially, has been used for fencing poles and provides good firewood. Zulus take an infusion of the bark as an emetic and the leaves are used to relieve abdominal troubles in children. The grey-brown bark is often fissured and flakes in place. The fine feathery leaves are bright green initially and make a splendid display in a garden setting. A Blesbok midden may be seen in close proximity on the right side of the trail. Smaller black pellets which you may come across are from duiker or klipspringer. On your left, just before the bare exposed rocks is a Jacket plum (Pappea capensis) No 433 with a Blue Guarri (Euclea crispa ssp.crispa) No 594. The Jacket plum is the same species as Lobengula’s Indaba Tree now standing on the grounds of Government house, Bulawayo, Zimbabwe. The fruits are edible having a pleasant flavour. They can be made into a jelly, an alcoholic beverage and a vinegar. The oil from the seed is claimed to restore hair. Many farmers oil their guns with the oil. The bush growing at the base of the Jacket Plum is the common Brides Bush (Pavetta gardenifolia) No 716. Notice the many different grass types – Eragrostis chloromelas, Elionurus muticus, Setaria sphacelata, Eustachys paspaloides, Digitaria. It is amazing how many flowers manage to exist in the veld. Burning of the grasses exposes the flowers but this must be done judiciously. Some flowers to observe are Hypoxis, Scadoxus, Barleria, Solanum incanum, Verbena, Cucumis hirsutus and Scilla. The tall tree situated on the rocks to the right is the River Bushwillow (Combretum erythrophyllum) No 536. It usually occurs along riverbanks with the trunks reclining and overhanging the water. In Autumn, the leaves turn red and the specific name refers to this. The seed germinates easily and the plants are fast growing. It is surprisingly drought resistant and does well in gardens. You will also see a number of Dassies around. 10 The trail turns to the right after this and you will soon find a drinking tap on the right at marker no 10, which has been installed for the thirsty. 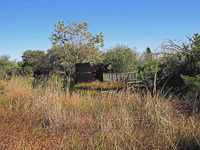 Looking to your left, you will see the hide, which overlooks a man-made dam that follows the natural run-off of the area. There is a large bullfrog living in the reeds. Frogs are insect eating; however, they have been known to eat the odd small rodent. There are also River Frogs, Raucous Toads, Crabs, Fish and Terrapins in this little dam. The small trees on the near side of the dam are known as Ouhout (Leucosidea sericea) No 145. It derives its name from the gnarled look of its trunk. After crossing the boardwalk to the hide, the tree on the left is a Buddleja saligna and the tree on the right next to the hide is a Jacket Plum (Papea capensis). The large umbrella shaped thorn tree is an Acacia sieberana No 179 (Paperbark thorn). To get to the next section of the trail, return on the boardwalk over the spillway, turn left and you will see a marker pointing straight ahead down the slope. Follow these arrows to walk down to the Kingfisher Bird Sanctuary, after which you should return to this point and follow the arrow pointing through the trees to the left. Zizyphus mucronata No 447 – The Buffalo thorn. In Botswana this tree is considered to be immune to lightning. Dais Cotinifolia No 521 (Pompom tree) with round heads of pink to mauve tubular flowers. These were obviously planted in the reserve. 12 Follow the trail over the storm water outlet area on your left and along the road for ± 200 metres past Acacia karroo trees. Ouhout trees will be seen growing along the banks of the near side of the stream. After reaching marker no 12 you will reach a hide overlooking the dam with a conveniently situated bench and nearby unisex toilets. The dam contains large carp, terrapins, frogs and crabs. Water mongoose are in the area and many water birds are usually seen. Refer to the bird checklist in this guide. Have you noticed the mistletoe (Tapynanthus natalitius subsp. zeyheri) on the trees as you have walked by? The seeds are distributed by the Redchested Cuckoo (Roberts No 377) when it wipes its beak on a branch. The mistletoe is a parasite and becomes quite a burden to the trees, that now have to get factory cells working twice as hard to produce food for the unwelcome guest and itself. Many small blue flowered honey bushes on the left (Freylinia sp). Puzzle Bush (Ehretia rigida) No 657. This tree has dense tangled branches, which provide a cover for shy birds. The pale mauve to white flowers occur in considerable numbers and are sweetly scented. Bees are attracted by the large quantities of pollen the Puzzle bush produces. The fruit, orange when ripe, is edible and attracts many birds including Bulbuls (Roberts Nrs. 566-572) and Mousebirds (Roberts Nrs. 424-426). Several shiny green leaved bushes on the left (Noltea Africana) Soap dogwood. The crushed twigs and leaves are used to make a soapy lather for washing clothes. It is not endemic in this area. The area before and after the small metal bridge becomes marshy in the wet season. You will pass a bush willow on your left and a Rhus lancea No 59 on your right before turning left and walking up towards the main dam spillway and back up the west side of the dam. Explore the area on the left of the trail below and above the spillway and you will find yellow flowering Hypericum, Arum Lilies, Agapanthus, yellow Dietes and red-hot pokers. Also look for the ground orchid (Habernaria falicornis) that flowers in summer. After veering left from the fence you will find a small Rhus dentata No 381.1 (Nana-berry) on your right and a young 2m high, shiny leaved Dogwood or Blinkblaar (Rhamnus prinoides) No 452 on the left. Turn right ± 11m from the bench. 13 The trail meanders back towards the Norscot Koppies section past the container and uphill. Walk straight past number 13towards the marker just before reaching the dam where you should turn left and pass the old fig tree clinging to a rock on your left, then follow the pointers until you reach a fork in the path when you should keep to the right. Note the lichen on the trees. Algae and fungus make up lichen and it is an indicator of moist atmospheric conditions. If you ever get lost in the veld, lichen will act as a compass as it only grows on the south aspect of boughs and tree trunks. Spotted Eagle Owls have been flushed in this area but are not easily seen. Scramble up to a vantage point with a view to the northwest near marker no 14. 14 A tricky climb through an “eye” in the rocks at marker no 14 will enable you to reach the top of the tor and provide an even better view. This might prove dangerous if you are not agile and careful. Return to the fork in the path and turn right for a short walk through the forest and follow the arrow markers to number 15. 15 At this marker you will see a Blue Guarri tree (Euclea crispa var. crispa no 594) in front of you and slightly to the right. Note the dense round crown of this tree and the unusual blue green colour of the leaves providing a wonderful contrast to the adjacent foliage. The flesh enclosing the spherical seed is sweet and the fruit attracts many birds. The next marker will take you through the forest again. 16 On turning right you will soon reach marker no 16 in front of a Wild Elder (Nuxia congesta No 633) on the right. This tree is a hardy evergreen. The bark is dark brown, stringy and shredding. Cream flower buds form months beforehand and flowers open from May onward. The leaves are clustered toward the ends of the branches. This is a very good garden subject. Behind this tree and rising much higher, is the Kiepersol tree (Cussonia paniculata No 563). The Kiepersol is a hardy, drought resistant palm-like tree, found growing in the Eastern Cape, Free State and Gauteng. It is easily grown and makes a suitable garden subject with its dramatic trunk and unusual foliage. The leaves provide good fodder for game stock and the wood, which is greyish-white, soft and light, was used for making brake blocks on wagons. The name Kiepersol, which means umbrella, most probably originated from the Portuguese word ‘Quita-sol’. However, there is a lovely Afrikaans folk tale, which traces the name to the days of the 2nd Anglo Boer War. A commando put on patrol stumbled upon three British soldiers being pursued by an angry lion. The only tree in the immediate vicinity was a Kiepersol. The first two soldiers managed to make a dash for the tree and once safely in its boughs, they saw the third soldier making a run for the same tree – whereupon they shouted frantically to the third member of the party that the tree would not “keep us all”! 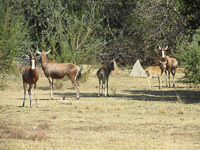 Duiker and klipspringer may be seen in this area. 17 When you reach the T-junction at marker no 17 you will find a natural “boma” on your right made up largely of Buddleja saligna with a large Jacket Plum on your left. From this marker turn left and follow the trail back to the entrance where you will find a member of our committee who will try to answer any queries you may have. Please make sure to report any unusual sightings or findings. We hope you have enjoyed your walk and will support us in our efforts here in Norscot Nature Reserve.